This, now gluten free, recipe has been many things over the years. 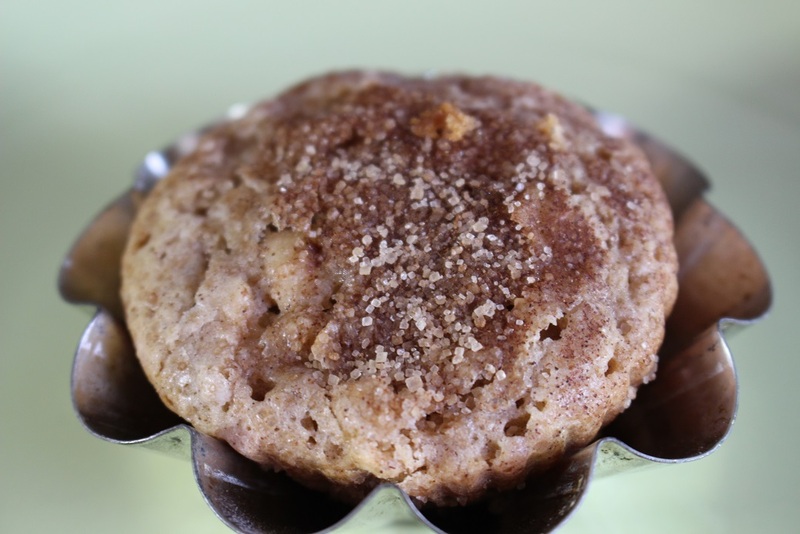 It started as a simple no egg, apple sauce muffin when my first son was a toddler and allergic to eggs. 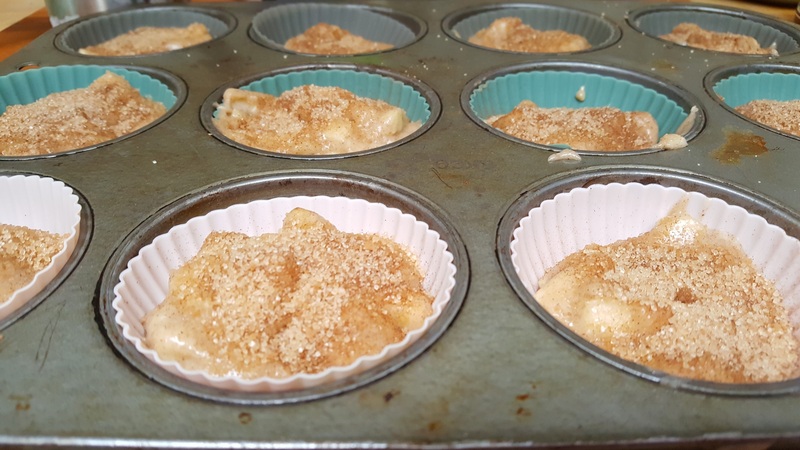 Every fall we would go apple picking, make our own apple sauce; with skins on of course, thus the sauce had a high pectin content making it perfect for use in these muffins without egg. Time passed, 2 more kids later and first dear son is no longer allergic to eggs. One day these muffins were requested and what, no apple sauce! We did have a few apples though. Thus a new version of these muffins was born! Instead of sauce, I finely chopped the apples. Guess what? The kids liked them better! Yay! Apples peeled and diced ready for muffins! Another few years have passed and we are at the final (maybe) version: Gluten Free! Yep this and many of our family favorites have had to be adjusted to allow for celiac disease. 18 years these muffins have survived. You may ask why? Why stick with the same recipe? How do you say no to the smiling face of a 3 year old, a 6 year a 10 year old who wants to learn how to cook? Instead of asking for chocolate chip muffins or cookies they’re asking me for healthy apples; rich in antioxidants, flavanoids and fiber, how can I refuse! With the kids older now my final recipe is a bit more sophisticated than the original sauce version. I have incorporated a smokiness by adding a gourmet salt. I hope these become a favorite in your household! Today we had Spartan apples that had seen better days, perfect for baking! 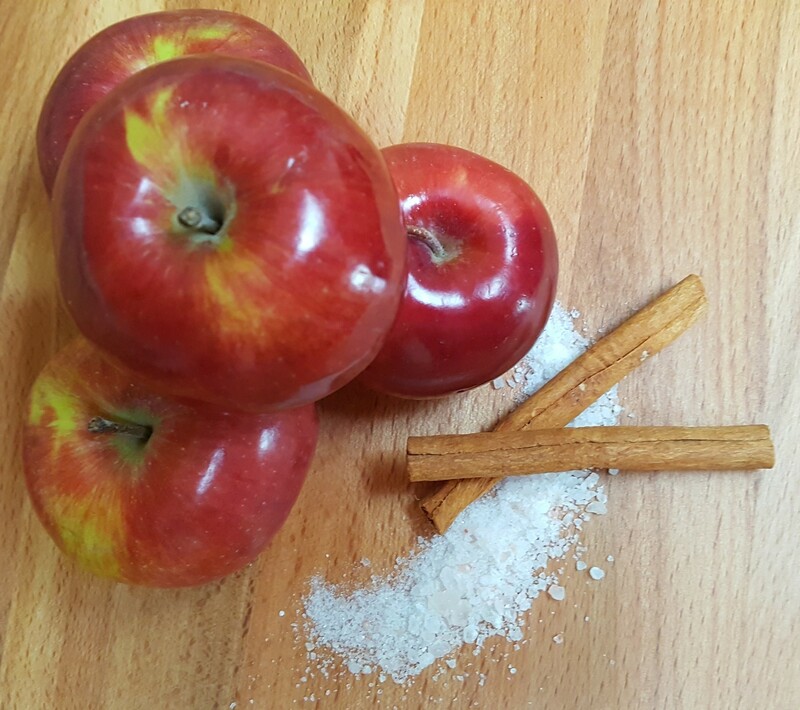 Tip: This recipes works with any variety of apple so use your family favorite! If you are looking for a particular texture just remember that the softer varieties such as Macintosh or Gala will almost dissolve while the harder varieties such as Honeycrisp or Mutsu will stay in chunks (my favourite). A variety such as Granny Smith (super yum! )provide a nice tartness that compliments the sweet and salty topping. In my house less is more! And with 6 people in the household this recipe usually gets doubled. So I go for the smaller muffin tins so that I can encourage the kids (and myself) to have a piece of fruit or vegetable alongside the muffin as a snack; if they are still hungry. Prepare 6 large muffin tins or 12 small muffin tins with liners (I like the reusable silicon ones. Get them here!). In a medium bowl mix together egg, sugar, sour cream and melted butter until creamy. 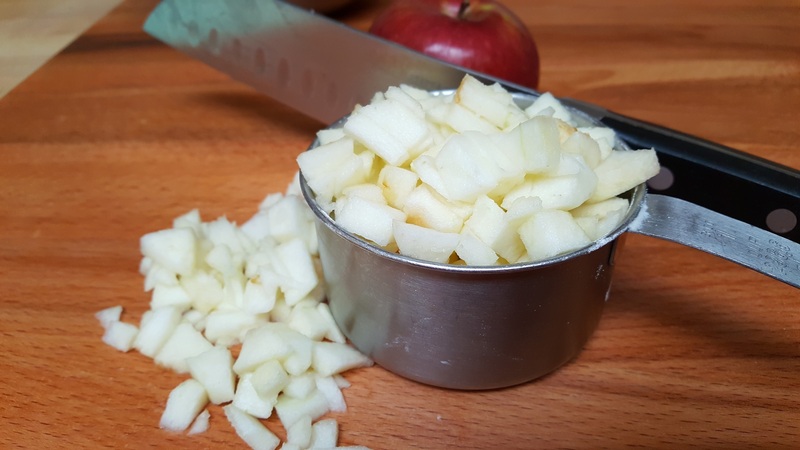 Mix dry into wet ingredients until moist then fold in diced apple. Mixture will be thick! Spoon into prepared muffin tins halfway up. Top with ¼ teaspoon cinnamon/salt/sugar topping; more or less to your taste. Now here’s the tricky part; the number 1 reason I do not normally share this recipe! Humidity, variety of apple and flour blend all contribute to the cooking time. If you use my GF flour blend (see below), use a crisper variety of apple and make a dozen smaller muffins then bake for 25 minutes at 350 F, or until toothpick comes out clean. If you make 6 large muffins bake at 350 F for 35 minutes, or until toothpick comes out clean. General rule of thumb the softer, moist apples create more liquid thus the muffins take a bit longer to bake. I always set my timer for 20 minutes, check them and adjust the time accordingly. Crunchy topped Apple Muffin, ready to be devoured! I love to hear from you! So if you make these or change it up a bit please let me know how they turn out. Also they work perfectly with all-purpose or whole wheat flour as well.